Hi friends! Happy almost Christmas to you! I wish you so much love and peace and joy and hope it’s a day filled with all your very favorite people! We’ll be spending the day at home with all of our family coming over for a big dinner and gift exchange! I can’t wait to give my nieces and nephews their gifts! Today is the last Dressing Room post of the year! 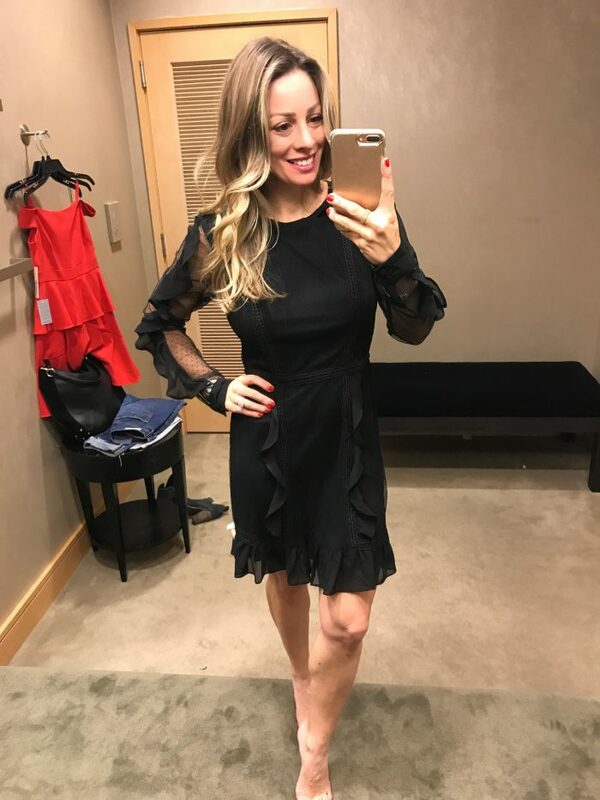 I was going to focus on NYE dresses, but I only found a couple I liked (see more here), but of course, I did find more cute and comfy casual wear and some really good deals! The sales are bananas lately! Some things you can still get in time for Christmas Eve with fast shipping! For size reference, I’m super petite, 5’1, 105, 34D. I usually wear 0P or 25 in jeans and XS or 0P tops. I hope that helps take the guesswork out of finding your perfect size! This sweater is soft and the colors are beautiful – more muted than what you see online. With these colors, you can wear any shoes or booties you want – black or brown both work. I’d also wear it with white jeans! A mock neck sweater with flare sleeves will keep you warm and cute. This one also comes in grey and cabernet. I’d probably wear it with a long pendant necklace to add a little extra interest. If you’re a texture junkie, you need to have this sweater!! The velour is so soft! It’s cozy like a sweatshirt, but super sassy being off the shoulder. Dress it up for a night out or get SUPER cozy with velour joggers! With all off-shoulder tops, I swear by this strapless bra! I liked the versatility of this hoodie because it’s a good mix between casual and structured. This picture makes it look like it might be a blazer, but if I turned you would see that it has a hood on the back! It’s a little stretchy with pockets and a great outer layer for a colder office or being out and about on weekends. The dark charcoal color is nice because it can be worn with so many things. This is the thin, soft type of cardigan that I adore. The color is nice and the sweater is thin enough that it could be worn as light layer if that’s all you need. What’s this? Another striped top?! But, this one is slimmer fitting and also REVERSIBLE! You can wear it as a v-neck or turn around for a crew neck top. Two tops in one! This would look great tucked into pants or a skirt and also with a cardigan or blazer on top. One way to add interest to a basic tee is with a peplum hem. The material on this one is nice and soft and lightweight! It comes in 4 different colors/patterns and it fits true to size. How cute is this top?! 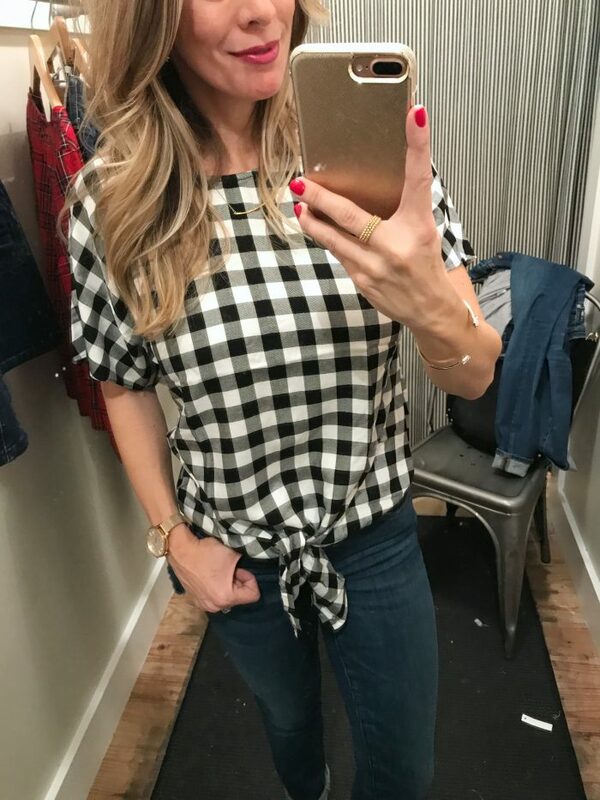 I think this gingham is sold out, but you can get a blue stripe version that’s a close runner-up! Even though it ties in the front, it’s not tummy-bearing so it could be appropriate for work with pants or a skirt. As I’ve gotten older and had two kids, I’ve really come to appreciate good, high waisted jeans. Madewell is known for their denim so I was excited to try these on. You can see I rolled them – petite sizes aren’t offered in the store, but you can get them online- along with tall and taller!! These are a great pair if you want a teeny bit of texture and a pretty solid medium wash. 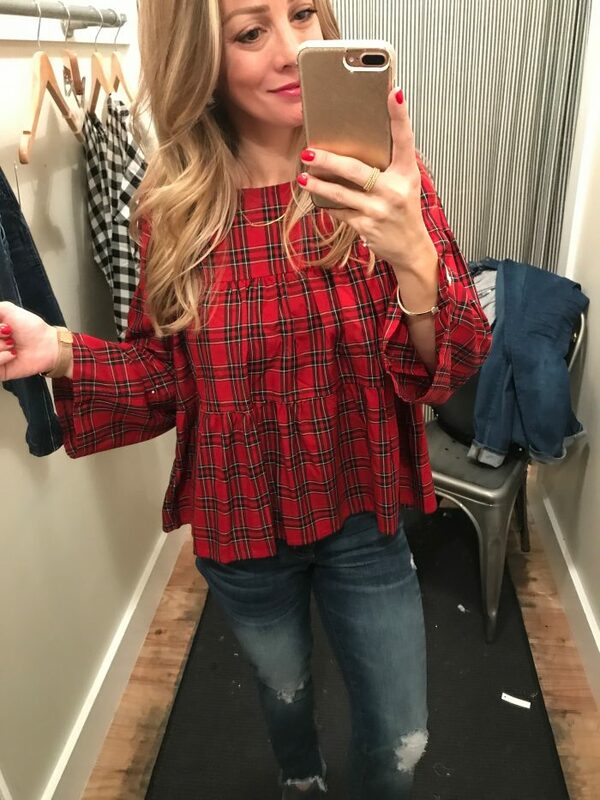 This plaid top is festive and fun for the holidays and also comes in this heart pattern that’s perfect for the new year or solid red, white and/or blue! Cable Sweater XS • Denim Zip Skirt 24 (size down) – Both 30% Off! This zip detail jean skirt caught my eye first and I threw this sweater on because I am a big fan of the sweater/skirt/booties combo. This cable-knit sweater with the different braiding and the pompom detail would be a no-brainer if it didn’t have wool in it! The skirt zips all the way up/down, has 2 pockets in the front, and it’s a modern take on the old jean skirt style with the dark denim. You can see more ways I’ve styled a jean skirt here!! I dig this twist on a classic white button down top. The tie is cute, but in retrospect, I would’ve tied it into a small bow. The shirt is structured enough to make it feel work appropriate and I’m always a fan of 3/4 sleeves! They let you show off your bracelets! I didn’t have a cami to layer under this top, but if you’re feeling daring, you could wear it with only a black bra and it still wouldn’t be too scandalous. This bralette is gorgeous! I wear a medium in it and found it to be about as supportive as a triangle bikini top. This is date night material for sure! I started out this post with the intention of showing you dresses for new years eve, but didn’t find enough to make a whole post out of it but I did find 2 dresses I could recommend. First up is this black dress with ruffles and sheer sleeves. I’m not sure that it photographed as well as it looked and felt on in person. I tried on the 2P but probably would purchase a 0P because it needed to be a little bit smaller allover. I thought it was very modern and fresh though! The simple neckline allows you to dress it up with a statement necklace if you’re going all out. This is a GREAT, fun party dress! And I did find this rose gold sequin dress that’s pretty cute for only $65! Right now, it’s only available in black though. It’s definitely got that sparkle that would be perfect for ringing in the new year! It’s also lined, so it’s not scratchy! 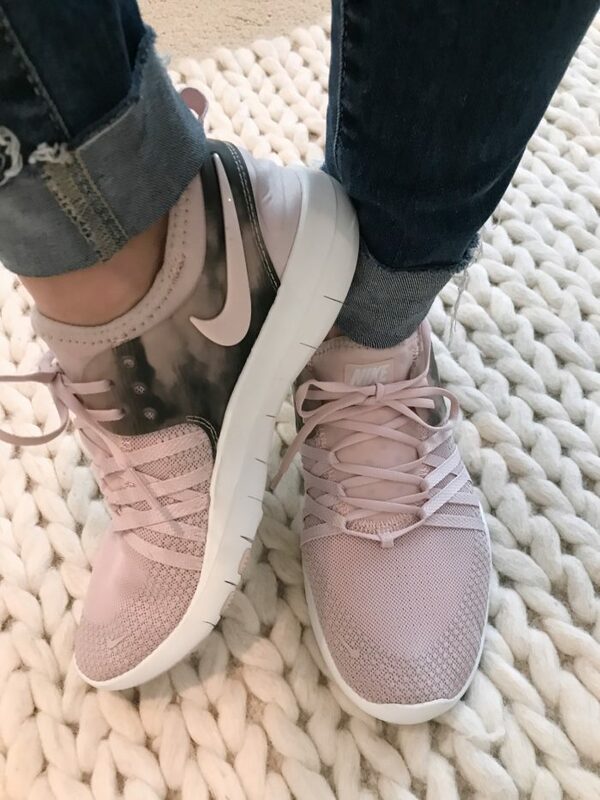 And last, but not least, I finally found a blush pink pair of sneakers that I’m crazy about! Not only are they super pretty, they are lightweight and cushiony and good for both running errands or low impact workouts. I’m super happy with these! Maybe they’ll motivate me to start working out more consistently in the new year! And if you missed it, you can catch my Outfits Lately here! ANN TAYLOR • 50% Off (almost) Everything! ANTHROPOLOGIE • 30% Off Gifts #bestgifts #awesomeaccessories and 25% Off Sweaters! GAP • 40% Off your purchase online!! H&M • Up to 70% Off Everything! Super Cute Sweaters!! OLD NAVY • Up to 75% Off the entire store! Kids’ Clothes are going for almost nothing!! Next Post Merry Christmas Friend! Loving that deep green sweater and the blush cardigan! And that gold sequin dress is fabulous!! what size do you wear in the Express came that is on sale? I want to order but I’m super petite and not sure what size. Merry Christmas! Random question, but do you wear any kind of socks with your booties? If so, would you share what you wear? Thank you!! Great question Jenn. I wear these no-show socks if it’s cold out- http://rstyle.me/n/cqqmxzpz4e They are really comfortable and I wear them with athletic shoes too!